You know what is decidedly extra, but also frustratingly enticing? A laptop with a display in the trackpad. Razer hinted at it with its concept Project Linda back at CES. But Asus... Asus just went ahead and built a display into the trackpad of a laptop you can buy later this year. 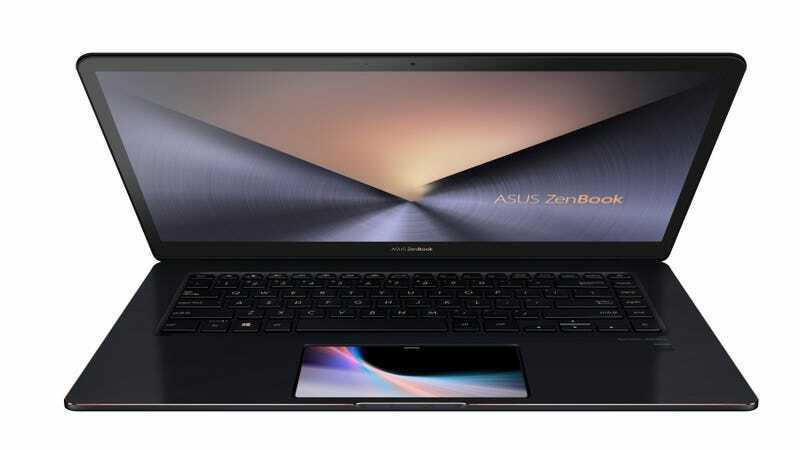 The Asus ZenBook Pro 15 with Screenpad, also known as the UX580, has a 5.5-inch 1080p IPS display where most of us expect a trackpad. As you would expect it can function they way all our boring and dumb trackpads do now, but it can also be programmed (if app developers so choose) with lots of custom shortcuts. Or it could, I guess, be like your Nintendo DS through 3DS. So it could have like... extra stuff down there. Maybe you could watch movies on it, or have a music visualizer. Asus says that out of the box it will have a configurable toolbar and work with Microsoft Office, Spotify, YouTube, and even the calculator. Besides the totally-unnecessary-but-I-want-it-anyways Screenpad, the UX580 can also be configured with up to a 4K display where the regular display is. The display will also support up to 100 percent of the Adobe RGB color space, which means better reproduction of the color green, and it should have a 178-degree viewing angle, making it solid for when you’re watching Netflix. It can be configured with up to an 8th-Gen i9 8950HK CPU, an Nvidia 1050 TI GPU, 16GB of RAM, and 4 1TB SSDs. That’s a lot of power, and it comes with a big price tag. The UX580 starts at $2300, but fully kitted out could go for another grand or more. We’ll know if that price tag is worth it when we get our hands on a review unit closer to launch. It’s expected to start shipping in mid-July 2018.